The influence of your deeds. How can your actions help people? Building on the previous lesson regarding words, this lesson’s goal is to teach kids that deeds or actions have a great impact. This lesson will reinforce the idea that “actions speak louder than words,” and remind the players that when combined with positive words, our deeds show accountability and build trust. In addition, we will tie in the previous lesson regarding words. Please note that this lesson closes with homework. Coach: Who remembers the toothpaste race? Who remembers what the toothpaste race taught us? Encourage conversation and answers about verbal leadership and the impact of words. Coach: That’s right. We learned that once we speak, we cannot take back our words. We also learned that when we use positive words we can lead people in good ways. I have another question for you: Has anyone ever heard the saying “actions speak louder than words”? Let the kids share their responses. Most will have heard this before. Coach: Great. Most of you have heard that. Can anyone tell me what that means? Lead the conversation by selecting one child at a time to answer the question. Coach: Those are great answers. Basically, “actions speak louder than words” means that doing something for someone is very powerful. Can anyone give me an example of something you did, an action or a deed, which helped someone? It could take some further questions and suggestions to get answers to this question. Most kids do good deeds, but may not identify them as that. You can suggest a few examples: opening the door for someone, carrying in the groceries for your parents, helping a sibling get something to eat or get dressed, cleaning up at school before being asked, etc. The point is to help them realize how helpful they already are. Do not rush through this part of the discussion. Coach: Those are all great examples of doing things that help others. When you open the door for someone, how does that person act? Does she smile? Does she say, “thank you”? When she smiles or says, “thank you,” you just led them to do that. It was your positive deed or action that led someone in a good way. It’s amazing, isn’t it? Just by opening the door for someone you led them to a have better day – or at least a better moment. Now think about what it would be like, if you offered helpful words first and then followed the words with a helpful deed or action. Maybe, you tell your mom you will help clear the table after dinner tomorrow night, and then, you actually do it without being asked or reminded. Facilitate discussion or other examples. Coach: When you combine your helpful words and your helpful actions you are making promises and keeping them. You are being a good leader. Keeping your promises is how you build trust. People will believe you and trust you, because you actually do what you say you are going to do. I have a special surprise for you now. HOMEWORK! Really, I am not kidding. I have homework for you. Have fun with their complaining and listen to them tell you about how much homework they already have. Coach: This is special homework. 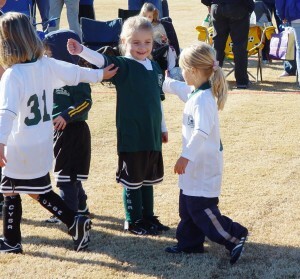 I know from watching you play together that you are all very helpful kids. Over the next few days, I want you to help someone with your words and your deeds and be ready to share it with the team at our next practice. It can be anything helpful at all. It would be great to talk to your parents about your assignment. In fact, I bet they can help you help others. I couldn’t think of a better example of leadership. Does anyone have any questions? Encourage the kids to be intentional about the homework assignment. The next lesson is dedicated to having each child share what they did to help someone. If you are practicing on consecutive days feel free to go to Lesson Seven and come back to sharing the homework after a few days have passed to give them more time. If you do this activity, it is critical that you tell the players when the homework is due and remind them before and after Lesson Seven. Take a few moments to access comprehension and answer questions. Then move on to a summary statement or prayer that references and reinforces this lesson.